UEC offers comprehensive solutions in engineering design, product development, rapid prototyping, and lean, innovative manufacturing services. 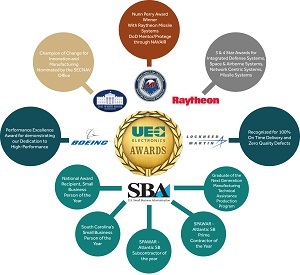 UEC’s core competencies include all facets of system engineering and requirements management, electrical, mechanical and software engineering and reverse engineering and life-cycle extension. Our Charleston campus encompasses over 72,000 square feet of engineering, integration, production, and testing facilities. Our experienced project managers ensure timely and responsive deliveries to meet your needs and schedules. UEC is incredibly fortunate to have a highly skilled, dynamic and responsive management team and work force. Every employee is empowered to facilitate and ensure continuous improvement and ultimately our Customers’ success. UEC’s diverse and highly experienced design and engineering team is comprised of system, electrical, electronic, software, and mechanical engineering professionals who work collaboratively to create unique and robust engineering solutions. 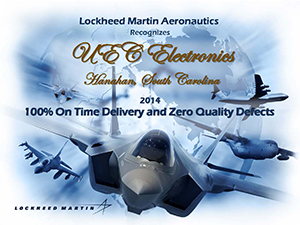 UEC is ISO 9001:2008 and AS9100C certified and has been the recipient of many distinguished awards. Please select the “Awards” link here to view them. Our mission is to meet or exceed customer expectations of value, performance, and quality through the continuous improvement of our people, our products, our services, and our processes.